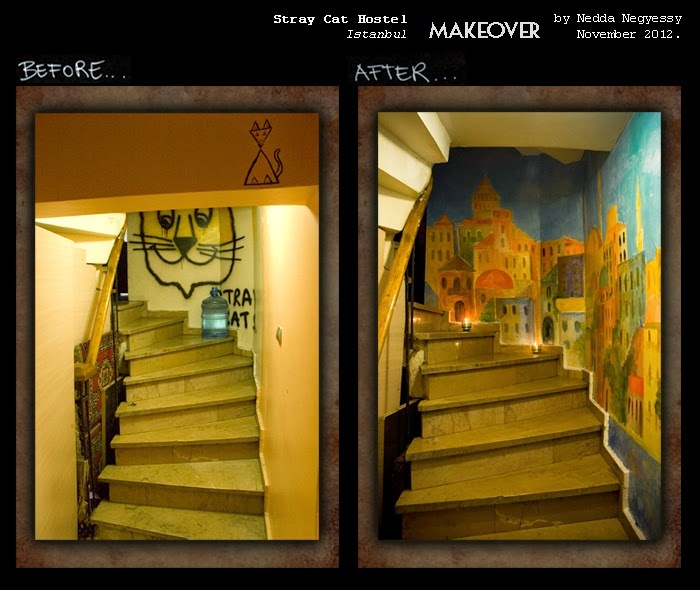 Álommunka volt - teljesen szabad kezet kaptam - a hostel 10 szobájával bármit csinalhattam... Köszönöm művész barátaimnak, akik közreműködtek és adtak nekem a munkáikból, hogy felhasználjam őket. 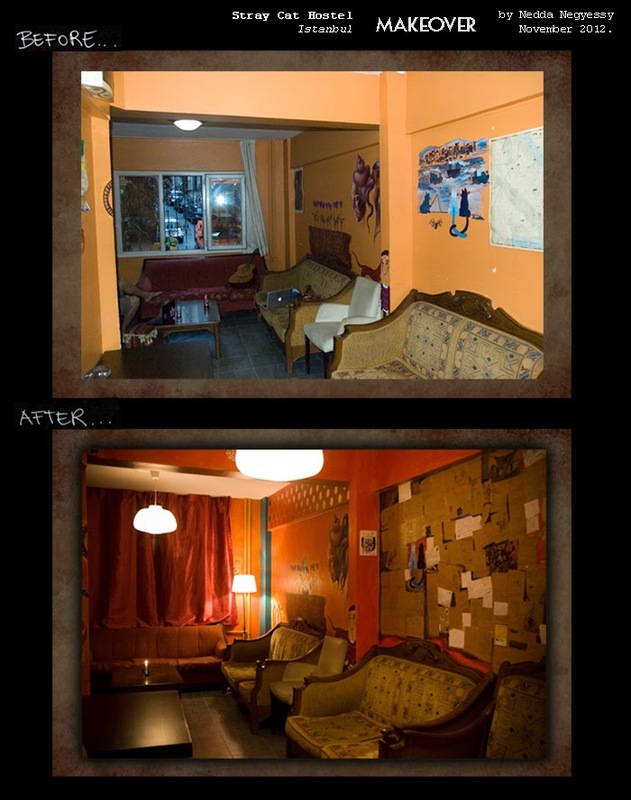 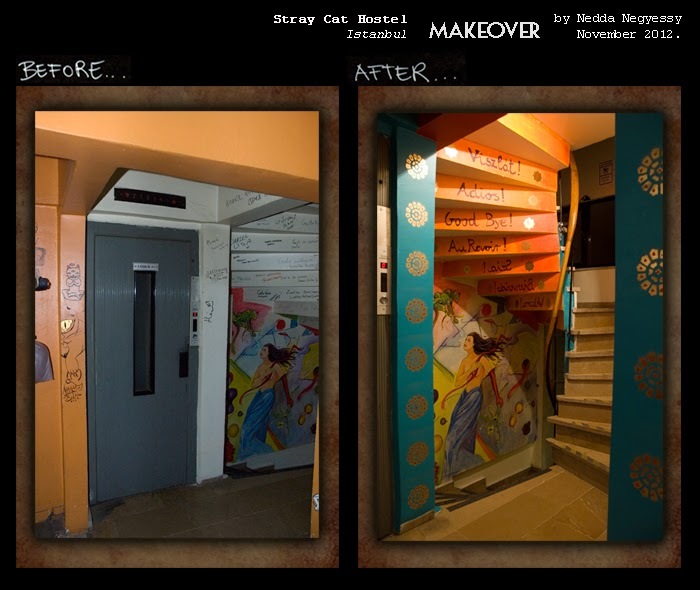 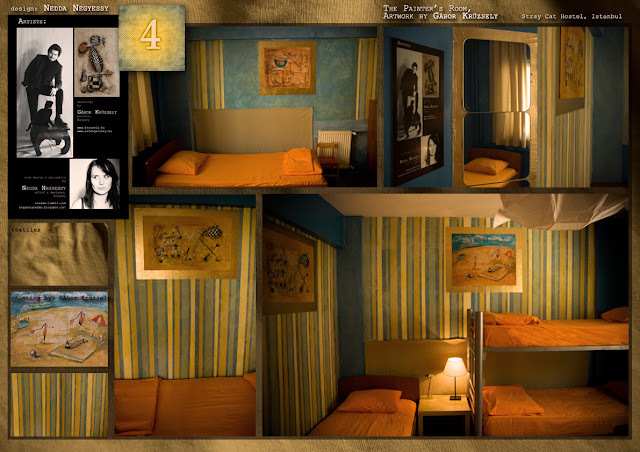 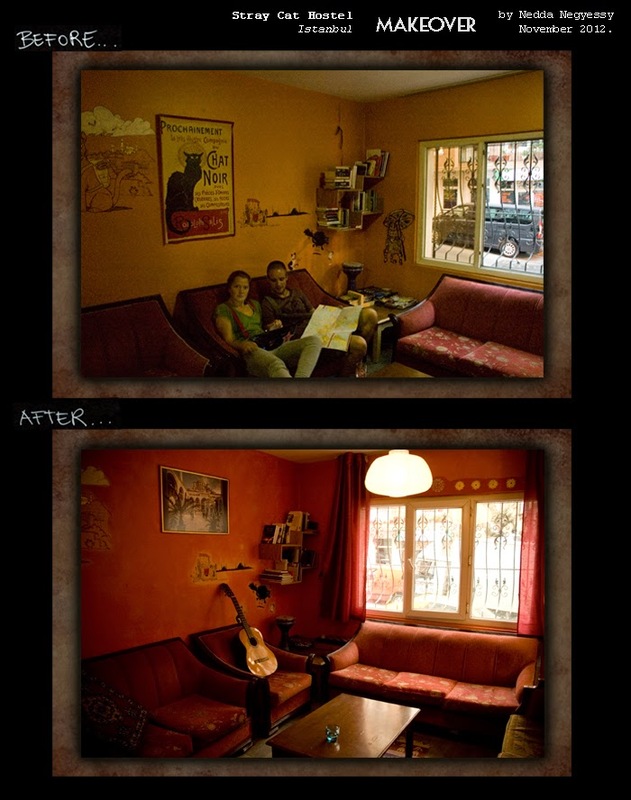 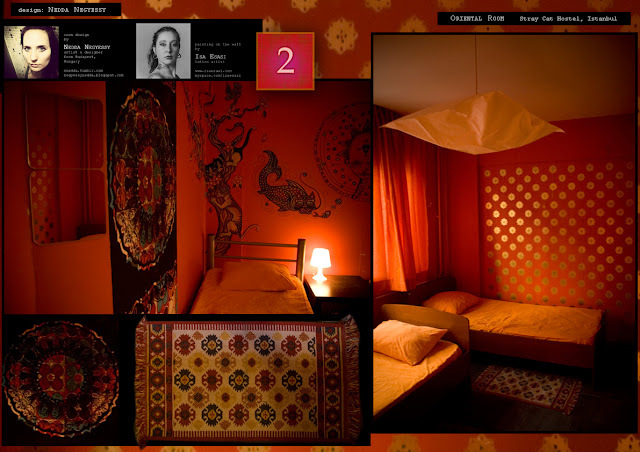 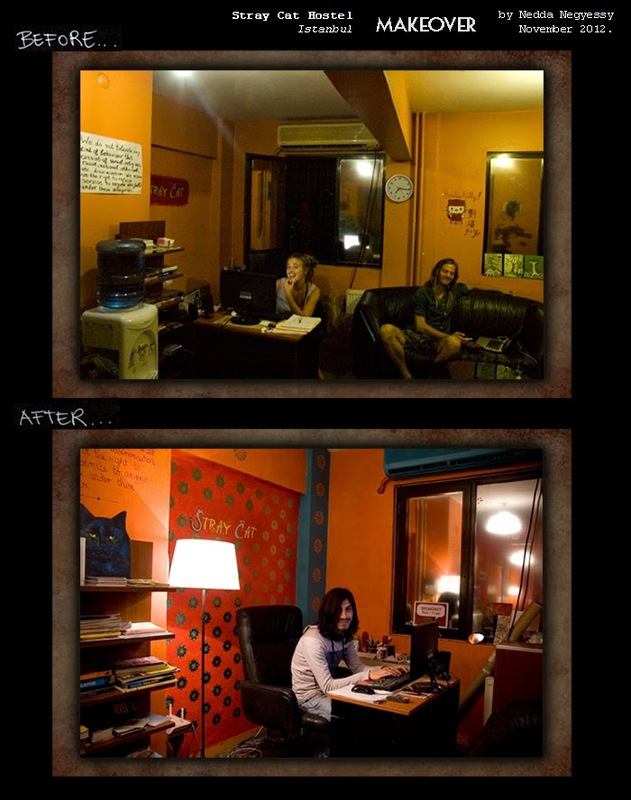 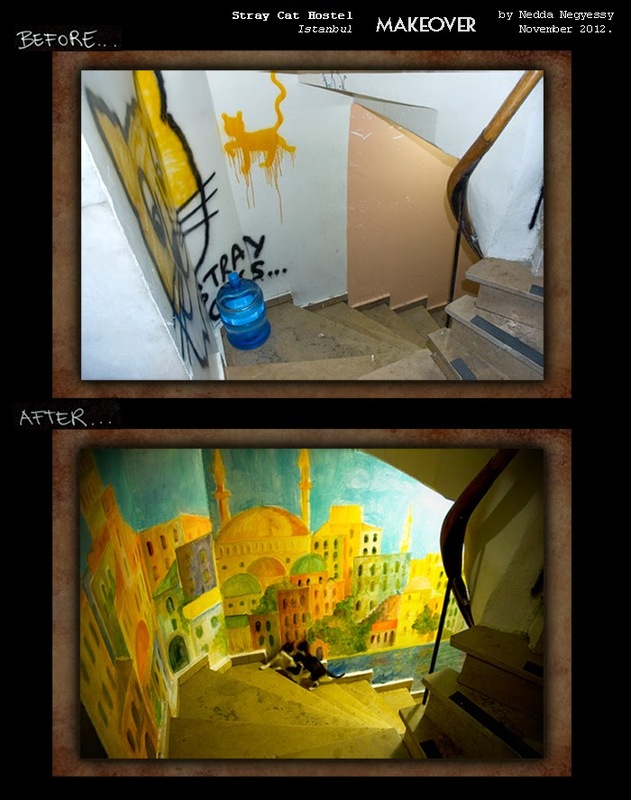 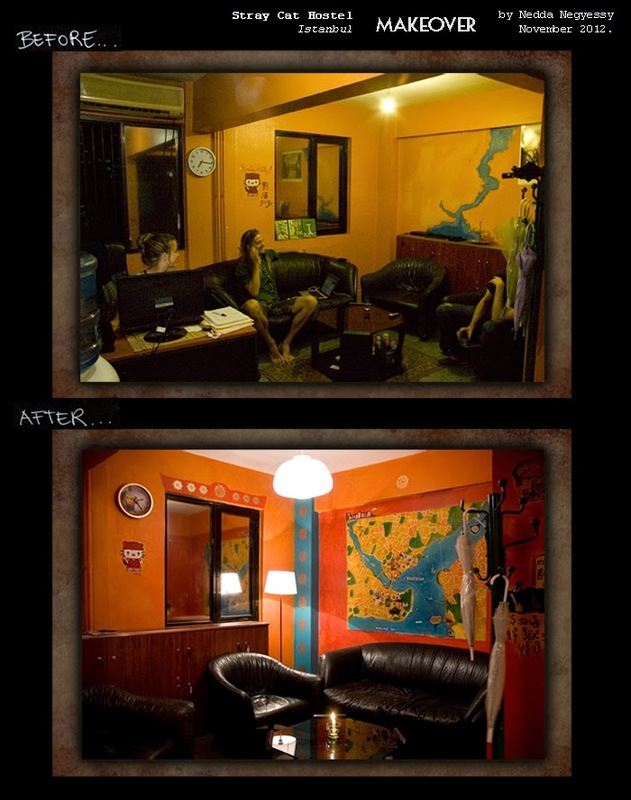 A dream job - I got a totally free hand - I could create bsolutely anything I wanted in all 10 rooms of the hostel. Many thanks to my artist friends, who gave me some work to use & for inspiration! 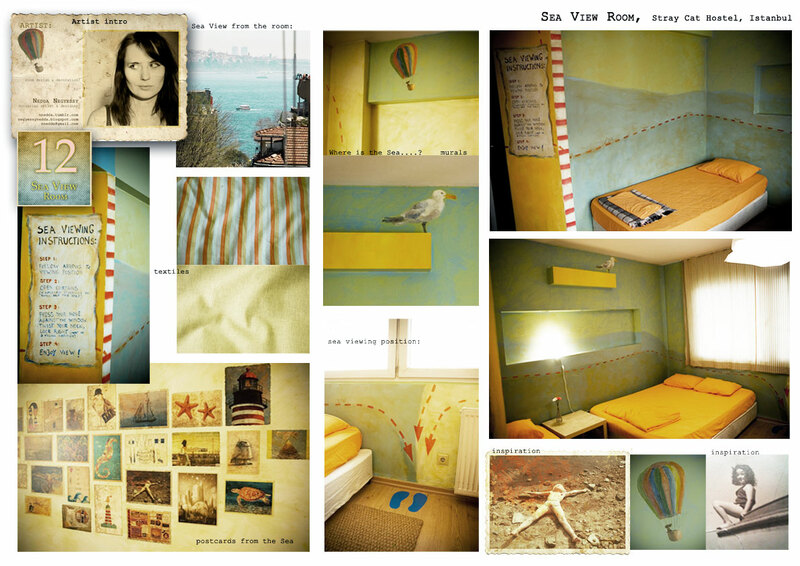 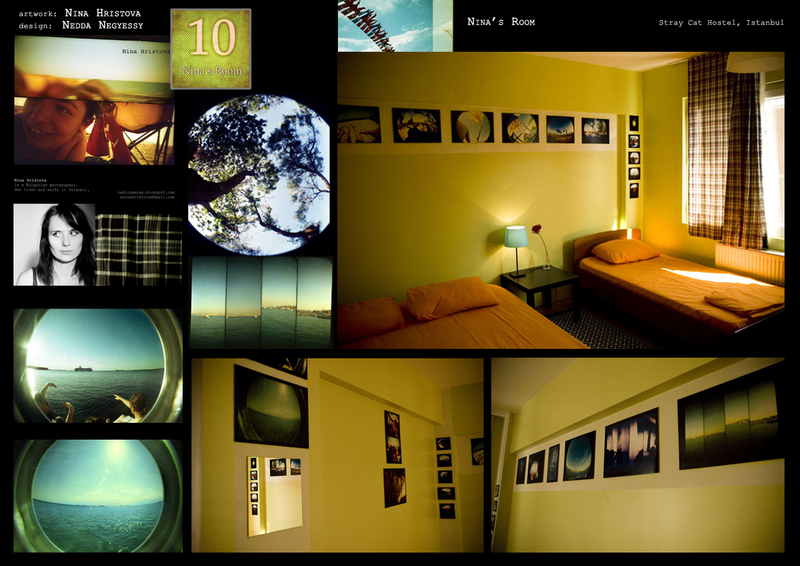 Nina's room - Nina Hristova is a photographer & friend who I met while in Istanbul... for this room she gave me some of her amazing lomography images...images of being on the road, being young & in love, images of cities and the seas, images of summer...I used them as a film strip to create a visual story. 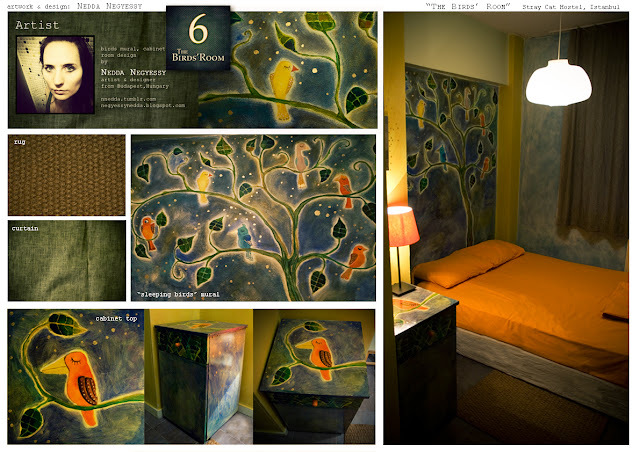 In collaboration with GAbor Kruzsely, Hungarian painter... he gave me some reprints of his gorgeous paintings & I designed the room to be the backdrop for his art. 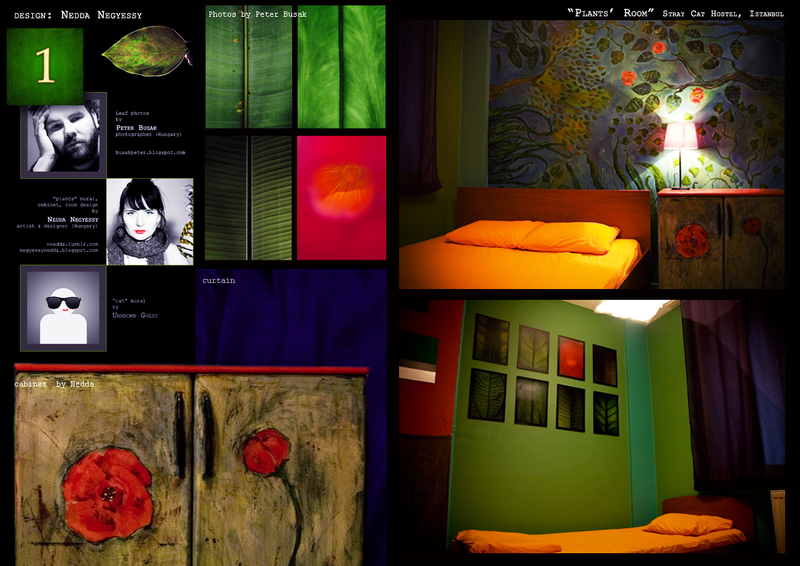 Oriental room - artwork from the amazing Isa Esasi - I kept it & added some new decoration to create an oriental atmosphere. Istanbul is PINK.... the walls of this room were originally pink, so this had to be room about the city. 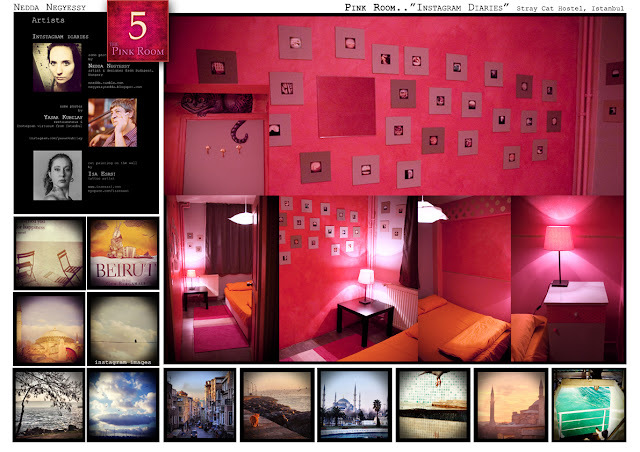 My friend Yasar and myself are also a bit of Instagram fanatics... so I used images from him & myself, all about Istanbul to decorate this room.... "Instagram Diaries...."
Here I got some artwork from great photographer friend Peter Busak ... details of plants... 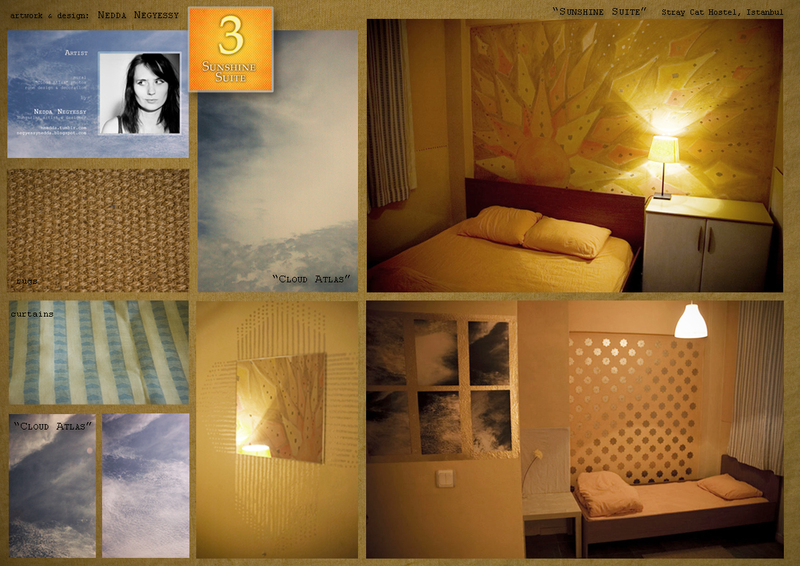 I used the images themselves & also as inspiration for the rest of the room's decoration... so here it is. 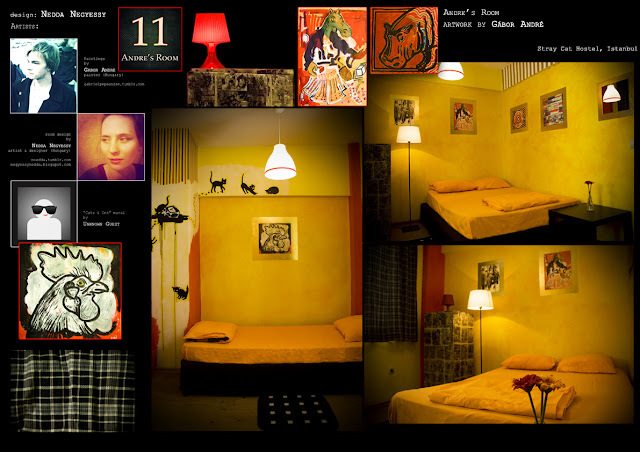 "The Plant Room"
The painting (by unknown guest) on the wall went really well with Andre's paintings... so adjusted wall colours & covered cabinet with comics & painted stripes & got stark contrasts.. created Andre's room. 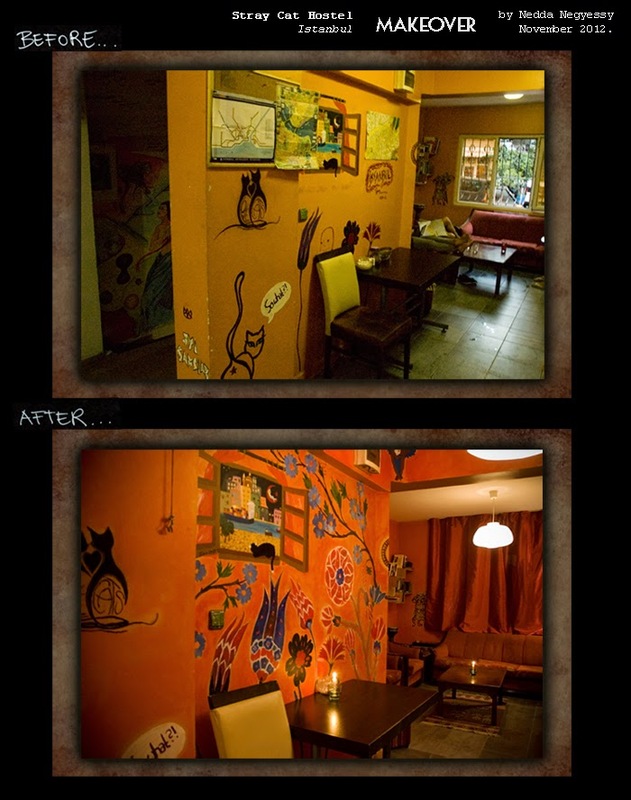 Changing the atmosphere of the common sitting area - some artwork on the wall was really nice - it just needed to be somehow brought together. 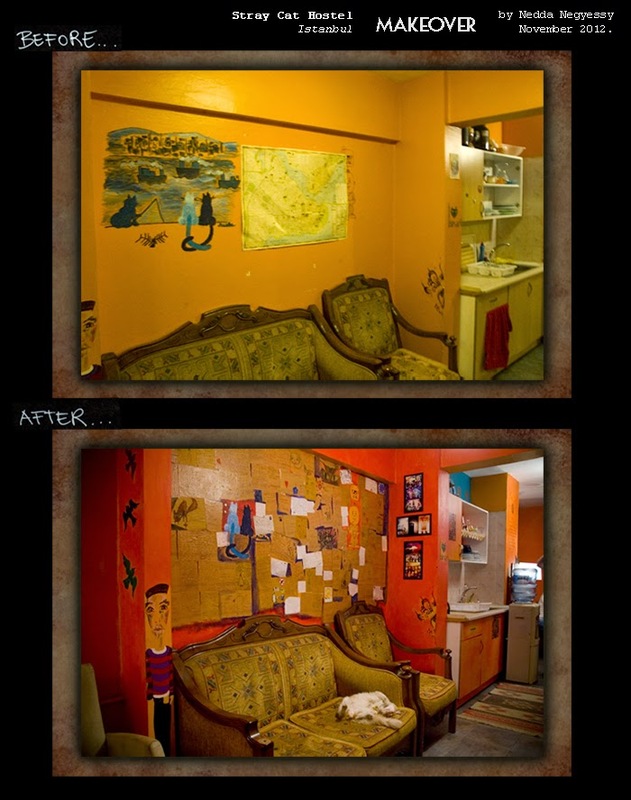 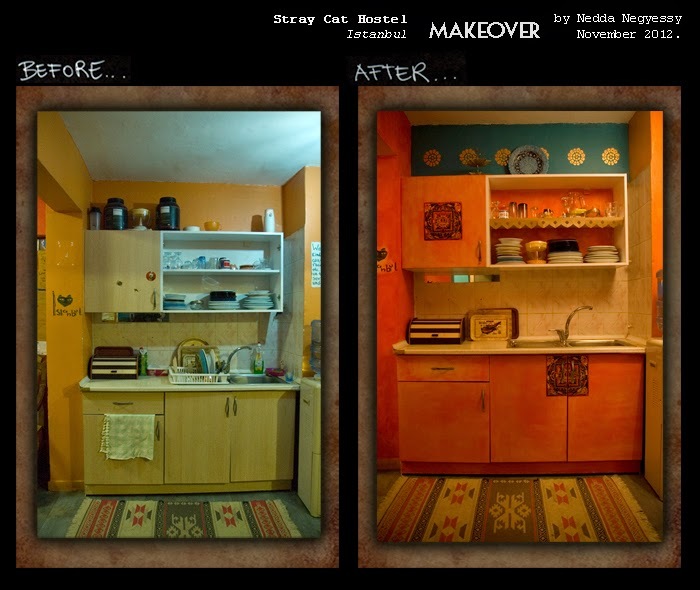 The overall warm tones stayed - I washed the walls over with some reds & oranges & applied stenciled sprayed patterns at stratigic points to create a less a calm and balanced atmosphere. 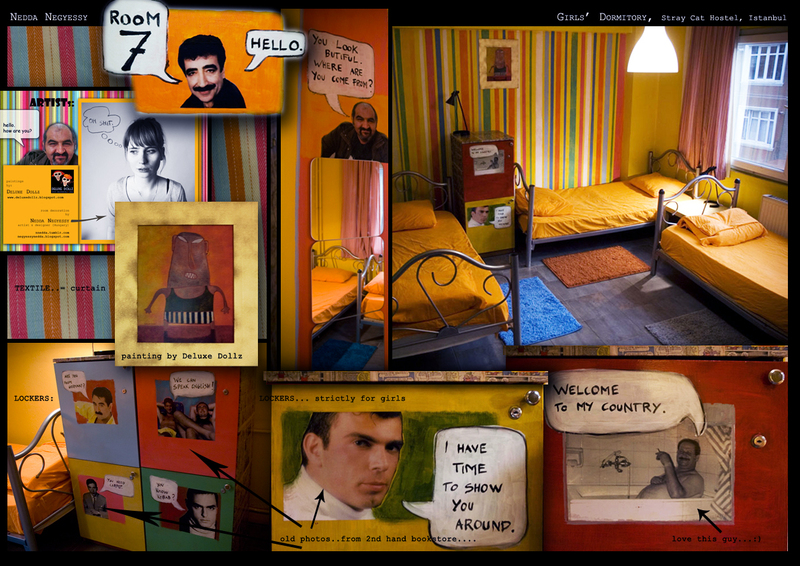 I find cellar-taped things on the wall awfully depressing :) so I had to get rid of the map and insead used the photocoped pages from the guestbookglued on with wallpaper glue. 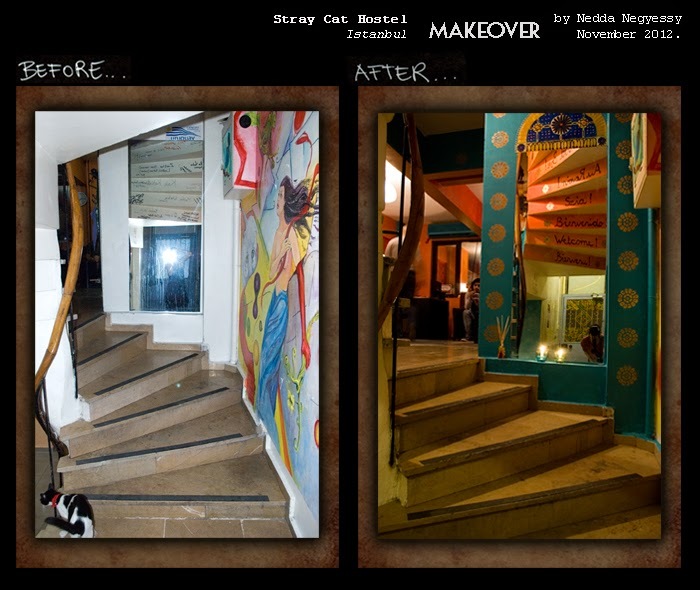 Reception - spray painted stencil patterns and a lamp make a huge difference. 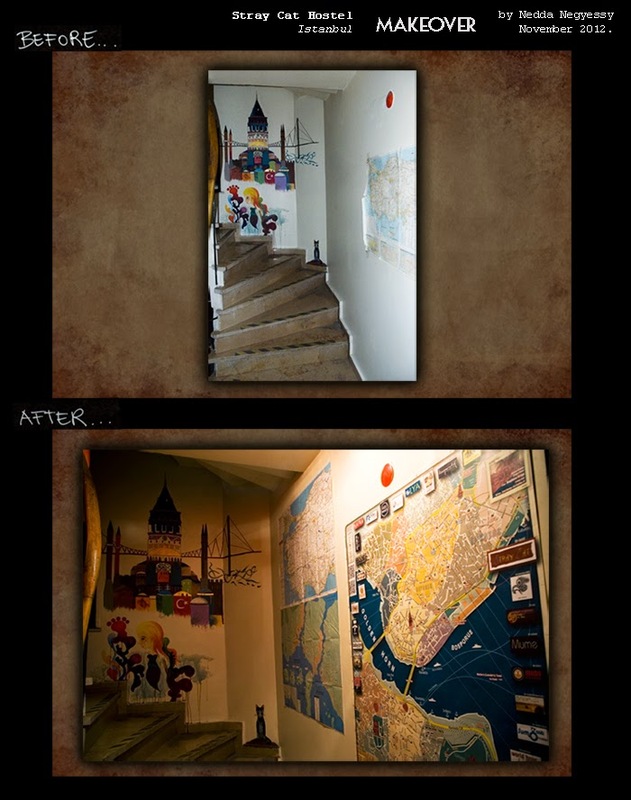 Stair case with City Spy Maps. Entance to the common areas & reception. Just paint & print & varnish.